Afraid to report that I just experienced game freeze upon Strix trap activation. Best to avoid Prestige level enemy bases for the time being. 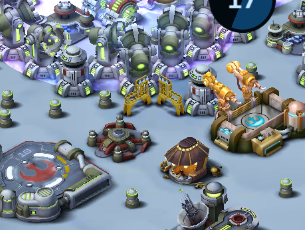 Does anyone know how many frags it will take to upgrade the rancors to LVL 2? The numbers posted by the data miners are unclear--I'm unsure if they are giving cumulative amounts of data fragments needed or marginal amounts of data fragments needed for each LVL upgrade. They are not cumulative. You need 60 to upgrade from level 1 to level 2. It's weird that they chose the numbers that are exactly the same as the cumulative numbers for units such as the demo droid. Dose somebody know, if the rancor trap is killed by shocktrooper/vanguard? And if so, do I have to rearm (catch a new species) it? Schruaf wrote: Dose somebody know, if the rancor trap is killed by shocktrooper/vanguard? Schruaf - Since it is a "trap" it is presumed to be vunerable to both Vanguards / Shock Troopers as well as the Rebel Han Solo Hero. If SBT (Strix Beacon Trap) is Destroyed by Han Solo or Vanguards / Shock Troopers prior to "activitation" it is presumed that you will NOT need to "Re-Arm" since the Creature was NOT defeated in Battle. ⇨ See In-Game Developer Notesposted in Main Topic Post for more information. i just ran into my 1st strix beacon. why did it feel so much better taking 3 stars from a wallet warrior? diszynga (yes i hear that in sheldon's voice) sure is making a mint from this update. anyway, the point i'm making, its like a trap, and it will just be triggered by your vanguard, then deployed. Noticed something odd while scouting earlier. Seems like the scaffolding for the beacon shows up while upgrading. Whoops. lol.